Source schedules allow you to specify the time and interval at which an action can be performed automatically on a source. Coveo Enterprise Search comes with a set of predefined source schedules. You can modify predefined source schedules or create new ones that better suit your needs. Example: You can create custom source schedules tailored for each of your large sources to distribute their refreshing in time to prevent stressing the Coveo and repository server resources. A best practice is to create and assign one or more custom source schedules for each source with optimized incremental/full refresh intervals (see What Should Be the Frequency of Source Refresh Schedules?). This also allows you to enable/disable a schedule for a source without affecting other sources. Note: A source must have been manually built at least once before a source schedule can rebuild or refresh it. In the Administration Tool, select Configuration > Schedules. In the navigation panel on the left, click Source Refresh. To deactivate/reactivate a source schedule, click [Disable]/[Enable] on the right on the corresponding line. Example: When an indexed repository is put offline, it is recommended to stop indexing the source to prevent unnecessary connection attempts. You can disable the corresponding source schedule. Note: Disabling a schedule from this Administration Tool page, disables the schedule for all sources using the schedule. 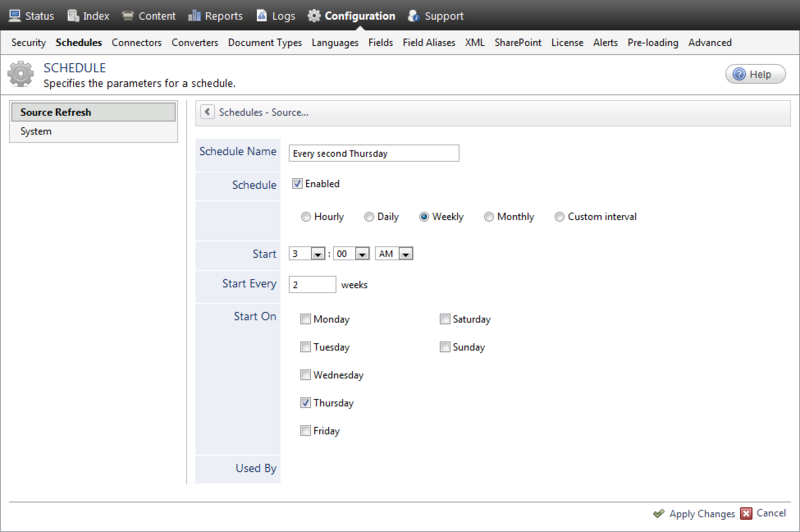 You can also disable a schedule only for a specific source (see Disabling a Schedule for a Specific Source). To create a new schedule, click Add. To modify an existing schedule, click the schedule that you want to modify. In Schedule Name, enter a name to identify the schedule. This name is what you will see in the Refresh Schedule drop-down list when you configure sources. A detailed description is created automatically based on the interval criteria. In the Schedule section, select the Enabled check box, and then select the frequency type (Hourly, Daily, Weekly, Monthly, or Custom interval for interval in minutes) (see What Should Be the Frequency of Source Refresh Schedules?). Use the Start, Start Every, Start On and Start Only The parameters to precisely identify when the schedule starts. Verify if the source schedule is already assigned to one or more sources. When it is the case, verify if the modifications are appropriate for all assigned sources. When not appropriate, rather consider creating a new source schedule, or change source schedule assignments. Assign the refresh schedule to one or more sources (see Scheduling Source Refresh Actions).